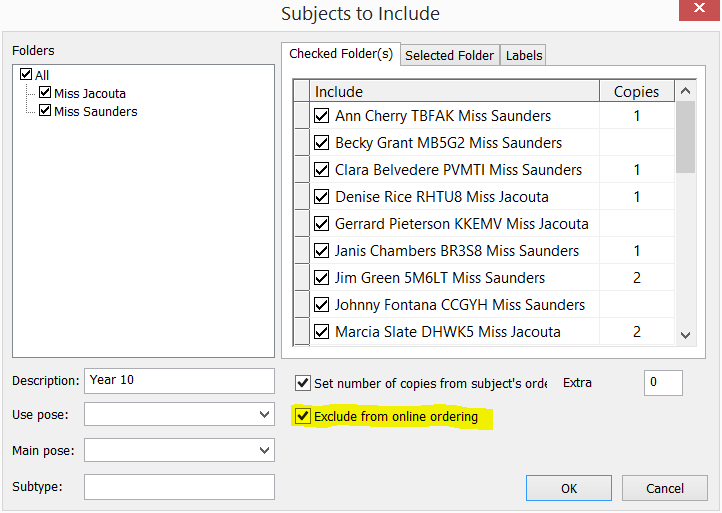 A key feature of the Timestone Internet Ordering System (IOS) is the ability to order composite group photographs. Moreover, with live rendering, the customer sees the subject's actual composite - not a generic, static graphic. This includes rotated composites where IOS will display the subject's own personalised page. If the job has been uploaed with one of the 'use previews' options the composite will be displayed with a graphic as set in tsAdmin for that package. If the job has been uploaded with the 'live rendering' option, IOS will display a rendered composite for that subject provided the composite page has been formed in NeoComposite or CompositeBuilder prior to uploading or refreshing the job. There are many circumstances where a subject can be included in two or more composites. A simple example is where a subject is part of the regular class composite photo together with a year level composite as well as various other miscellaneous composite groups. In these situations it is possible to control whether IOS displays all the composites, just one or some composites or none at all. Consider the scenario where a subject belongs to both a class composite along with a year level composite. The job is uploaed with an offer that has a package with a single composite product. By default IOS will display each composite the subject is a member of even though there is only a single composite product in the offer. The offer for the screen grab above contains a package with a single composite product. For a given subject IOS will display each composite the subject is a member of. Their are situations where a subject is a member of multiple composites but the composites need to be handled differently. Comsider the following two examples. The photographers offers both a class composite and a year level composite. The class composite is to be included in a 'Value Package' where it is bundled with a set of portrait prints. The year level composite is to be offered as a separate product. The photographer wishes to offer both a static and rotated composite at different prices. The default behaviour cannot accomodate these examples. In the first example the default behaviour is for the entire package (portraits and composites) to be duplicated - one showing the class composite and one displaying the year level composite as ilustrated below. In the second example the default behaviour will again display both composites thus not give the photographer to offer them as separate packages with separate pricing. In order to achieve the desired outcome both the examples above require the composites to be handled as different products. This would allow the different composites to be added to packages independantly of each other. This behaviour is achieved by labelling composites with a 'subtype'. Once a composite page has been assigned a subtype it will only be displyed with products of the same subtype. Different products can then be added to tsAdmin with corresponding subtyes. 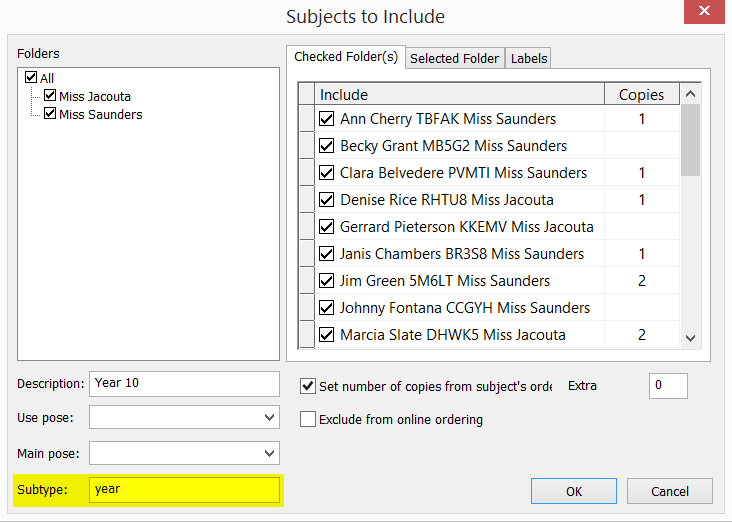 A composite is labelled with a subtype in the 'Select subjects to include' window of Form Pages Mode in NeoComposite or CompositeBuilder. Once a composite page has been given a subtype it can only be used with a product of the same subtype. The product is assigned a subtype in Timestone Administrator. The previous two screen grabs show a composite page labelled with a subtype "year" and a matching composite product in tsAdmin also with the subtypoe "year"
In order to achieve the outcome desired in Example 1, the photographer would create an offer with two packages. The Value Package with a 'normal' composite product sans subtype. This will display any composites without a subtype, namely the class composite. The second package would contain the composite product with the 'year' subtype. This will display the composite page with the same subtype. In a similar fashion an offer could be created with different products for rotated and static composites. The screen grab below shows two packages - one with a composite whose subtype is 'rot' and another whose subtype is 'stat'. The composite pages have matching subtypes with the end result being the solution needed for Example 2.